There are reports that Saudi Arabia lifted a ban on female cyclists! A Saudi daily cited an unnamed official as saying women can now ride bikes in parks and recreational areas but must wear a full-body abaya, be accompanied by a male relative, and stay within certain areas. They are allowed to bike for recreational purposes only, not as a primary mode of transportation. 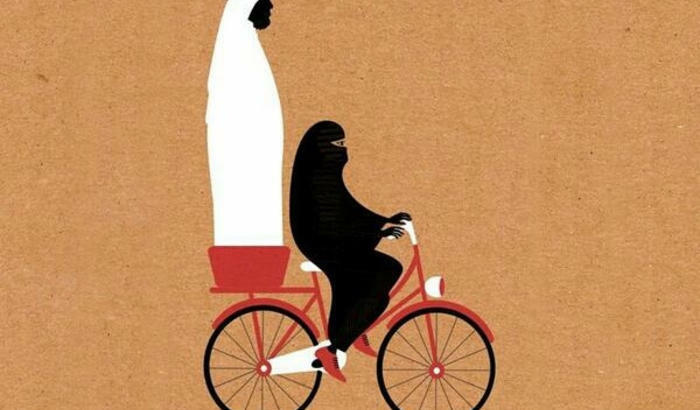 The illustration has one thing right - female cyclists wearing an abaya will definitely need a fully-enclosed chain guard, to prevent the abaya from getting tangled in it. But this is one small step. Perhaps they can require them to use only kick-bikes, like the Amish. It's only to increase the sales of tandem bicycles as the al Sauds have recently invested in a bicycle factory because their oil wells are running dry and they will need an alternative form of transport to motor vehicles. Have they designed burka friendly bicycles? One small (very tiny) step for woman kind. Now if the progress can just continue. A commendable move by KSA. Now can we move swiftly toward ending the proscription of Dykes on Bikes organising within the kingdom? Saudi Arabia is just getting too damn liberal. I wasn't planning on going there, anyway. lol I'm sure this was an april fool. Saudi scum would NEVER let women ride bikes. LOl. Are you sure? It's from Aljazeera the stream and April 2. Always assuming that the zealots* within the Saudi religious police don't just take upon themselves to implement their own personal ban on activities they deem un-Islamic. Like women riding bicycles. Mike. * In this case used relatively speaking. You must use the word Islamist!